As you'll easily see in the video below, Ronnie is a gorgeous 7 month old puppy. He has been at the centre for about a month and although he is your normal playful puppy, he has a condition called megaesophagus that means feeding and drinking is more difficult. Megaesophagus is a condition where the muscles in the oesophagus aren’t working properly. Normally, the muscles would expand and contract to push the food down while eating, but having this condition means that as Ronnie eats, the food and drink he takes in doesn’t move down into his stomach and instead stays in his oesophagus. The longer the food stays there, the higher the volume and this in turn can trigger the regurgitation reflex. This means Ronnie isn’t getting any of the food and not putting on any weight. Having this condition means Ronnie needs some special attention during feeding times. As shown in the video, he eats up in the chair and is left for a while afterwards because gravity helps to slide the food down and settle in his stomach. Having feeding time in this way stops aspiration pneumonia – when food or drink could go down into the trachea and into the lungs. Ronnie needs regular feeding and in the centre, they are currently doing this four times a day: at 8am, midday, 4pm and finally, those who live on site come in at 8pm to give him his last feed. This attention means Ronnie needs a very special home to give him all of the care that he needs. Despite his condition, Ronnie is still your average loveable pup – he likes the company of people, enjoys being with other dogs and loves his toys. He doesn’t require any special food, but the food does need to be ‘mushed up’ to help it go down better. Ronnie also can’t have normal water; it has to be in jelly form. Because of his feeding routine, Ronnie needs to be the only dog in the home. 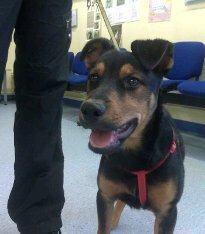 He also needs an active family and would be more suitable with older children. Due to his condition, Ronnie will be a part of our foster scheme and his new owners will receive financial support for any veterinary treatment required throughout his life. For more information about any of the dogs currently in our care, please visit our website. Caring for a dog with mega-e can be a challenge, but lots of us do or have done it. Please don't let Ronnie's condition put you off making him your newest family member. Anyone thinking of taking on Ronnie - don't think that the staff are kidding about his special requirements because they aren't. I had an old dog who developed a megaoesophagus and until I got the hang of feeding him, it got very messy. It is so worthwhile to do this but not a decision to be taken lightly.